Enjoy comfort and Maine charm while vacationing in this renovated and updated, two bedroom, one bath cottage . The large, wrap-around deck enjoys distant views of Stonington Harbor (and the islands!) and views of the hillside village of Stonington. Main Street is just a five-minute walk from the cottage or walk down the hill to Greenhead Lobster (a local lobster dealership), where you can watch the boats unload their daily catch and buy lobster for your dinner. If you like to flex your culinary muscles, you'll be very happy with the fully stocked kitchen. If cooking is not on the vacation agenda, you will find many, wonderful dining options within walking distance. If a foggy or rainy day should strike during your vacation, you can nestle into one of the comfy nooks around the cottage with a good book. 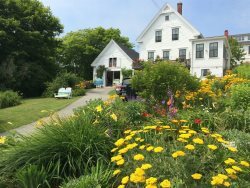 Our affordable, rental cottage is a great spot from which to explore, Stonington, Deer Isle and Acadia National Park (just 6 miles away by ferry).